This quickly sets the options based on performance. To set an individual feature, click on the Advanced button below. Set the screen resolution to be used. This cannot be set larger than the computer is already operating at. Note that higher resolutions require more processing power and can lead to a drop in performance. Note that Train Simulator will restart after changes to the screen resolution. Switch between Windowed, Full Screen and Borderless modes. This enables dynamic shadow and lighting effects which significantly enhance the appearance of the game. Change display brightness – only available in Full Screen mode. Customise the graphical options individually rather than using the Master Detail option above. Default Restore the graphics settings to default values chosen at installation. This sets the options based on performance of available hardware. Defines how smooth geometry appears. Higher combinations require significantly more hardware to run efficiently. Defines how crisp textures appear. Higher settings require significantly more hardware to run efficiently. The complexity and quality of models and textures display. The amount of scenery displayed. The distance out to which scenery is displayed. The sharpness of shadows cast by objects. The clarity of reflections displayed in water. Toggles the display of automatically generated grass near the camera. Toggles light intensity when moving from areas of darkness into areas of brightness or vice versa. Depth of Field Toggles a blur effect of distant scenery to simulate focus. The Gameplay screen configures how the simulation itself operates. Select from Expert or Simple methods of train control. Toggles the display of text when the mouse is over an interactive item. Toggle vehicles to couple automatically on contact. Toggle computer controlled Fireman operation. If a signal is passed when it is Red, the scenario will be automatically ended. Displays a message if the scenario chosen is not translated into the language being used. Toggle ability to allow any coupling type, to connect with any other. Pauses gameplay while message boxes are displayed on screen. 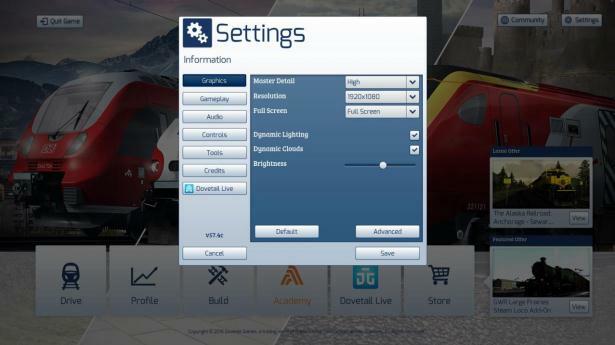 Toggle display of the intro movie when Train Simulator starts. This controls the overall volume of audio in Train Simulator. This controls the background audio when driving trains. Toggle playing of music in the Front End Menu System. Toggle application of reverb effects while driving. This affects such things as echo in tunnels, and the reflection of sound through cuttings or passing over bridges. Allows for automatic detection of the Xbox 360 Controller if one is connected. If set to Mouse/Keyboard, any connected controller will be ignored. Affects the response time of control inputs from the chosen device. Toggles vibration of the Xbox 360 Controller. Affects the vertical direction of movement applied by the Xbox 360 Controller. Forward for up, backward for down, or vice versa. Available only if Train Simulator is running in Windowed Mode. This button opens the folder in which additional DLC related manuals are installed. If installing non-official content, this option forces Train Simulator to recheck what content installed. This option will delete the complete progress obtained by the player. While no purchased or installed content will be lost, any scenario completion, Experience Points, Medals or Achievements will be reset. This controls the display of Google Maps in the World Editor.